Amylulita says...: L.A. 2nite!!! 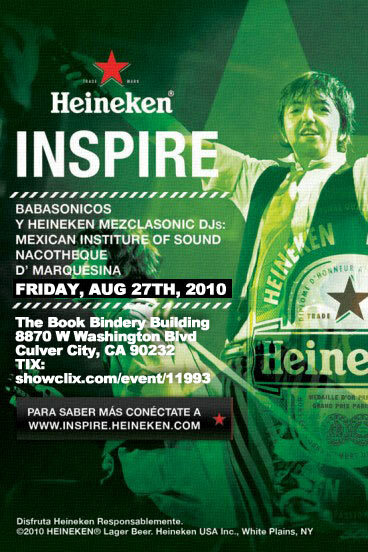 Aug 27 Heineken Mezclasonic Tour w/ Babasonicos!! L.A. 2nite!!! 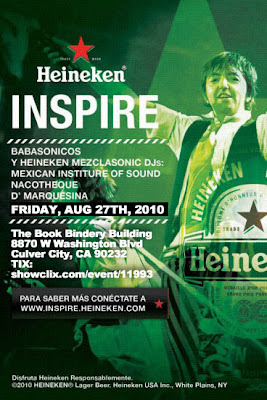 Aug 27 Heineken Mezclasonic Tour w/ Babasonicos!! On August 27, Heineken brings “Heineken Inspire,” an exclusive summer event featuring an eclectic mix of performances from some of today’s hottest acts to an exclusive Los Angeles location. In addition, Heineken Inspire will serve as the launch event for the “STR Bottle,” an aluminum bottle that when viewed under the black light of a bar or club illuminates to reveal a previously hidden design. So don't forget to look for it! FREE COMIDA, FREE CHELAS, FREE MUSICA, FREE ENTRY w/ RSVP!! Price: To get tickets, enter the code and donate $1 or more to Life Rolls On.. PLEASE NOTE: Only 2 tickets per person for the weekend. You may not reserve tickets to more than one event. I.D. Required. Must be a US resident only. “Heineken MezclaSonic” fosters innovative sounds by bringing together Latin “Mashup” DJs to mix and blend unexpected musical combos. Songs and beats from traditional Latin genres are mashed with popular urban beats and mainstream music including reggaeton, hip hop, electronica and funk to reflect the bicultural, dynamic style of modern American Latinos. Three top DJ groups in the Latin “Mashup” scene: the Mexican Institute of Sound, Nacotheque and D’ Marquesina, will be the first to deliver this unique musical experience through Heineken MezclaSonic.